I am out in LA for DisplayWeek, but came in early for some extra meetings. 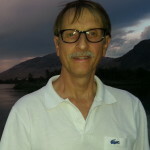 One of them was to visit with David Keighley, President and Chief Quality Officer at IMAX, and to get a demo of the new RGB laser projection system. To many, Keighley is IMAX. He and his wife Patricia have been with the firm since the early 1970s when there was only one IMAX theater. There are now more than 1000 IMax theaters in over 66 countries (over 500 in China alone). Keighley always carries a booklet of every IMAX theater, which he quickly pulled out when our conversation turned to the opening up of the Saudi Arabia market to theatrical exhibition after a 37 year gap. Interestingly, there has been an IMAX theater there for some time in a museum, but it was only for documentaries, not feature films. 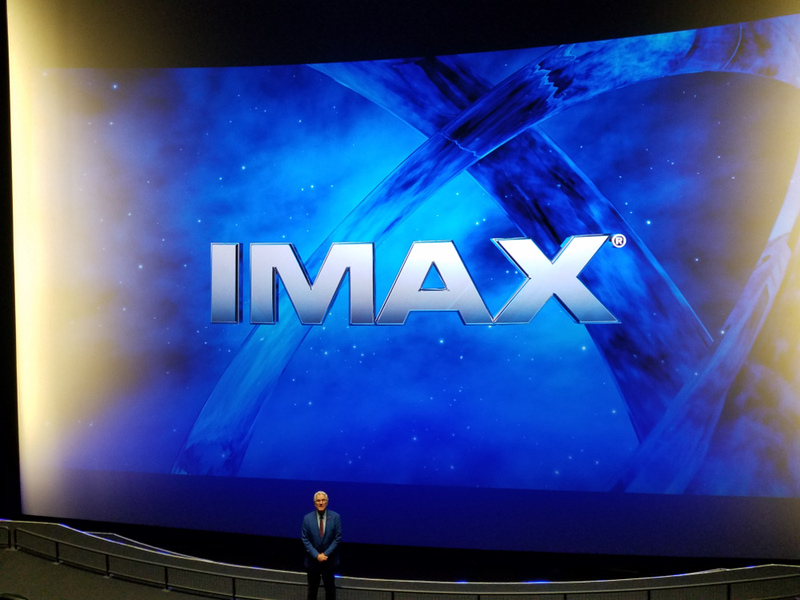 The new projector that IMAX has developed in partnership with Barco is branded “IMAX with laser.” It is a single projector solution designed to replace Xenon-based solutions for IMAX theaters up to 80’ (24.4m) wide. Above this level, the dual-projector GT RGB laser system is used. This solution was rolled out about 2 years ago. The IMAX theater in Los Angeles is the only one currently showcasing the new single projector RGB laser IMax solution. IMAX’s current Xenon-based projectors have a rating of around 2500:1 using a slightly apertured 3-chip DLP prism architecture. The new projector features an RGB laser source and a prism-less architecture. It is similar to the GT dual-projector systems, but has made improvements in materials to improve sharpness. According to IMAX CTO Brian Bonnick, who I spoke with previously, the light and therefore heat on each DMD varies based on the scene content, so there can be a differential in how the DMD responds to this load. This can cause slight misconvergence of the red, green and blue light paths, which are more obvious on a big IMAX screen. By carefully controlling the humidity and thermal environment of each DMD, IMAX is able to obtain an incredible level of sharpness. IMAX has gotten away from describing performance specifications, but Bonnick did reveal that sequential contrast is over 10,000:1 and ANSI checkerboard is the highest they have ever achieved. Bonnick said they have other methods to determine the “bleed”. By this he means light leakage from a bright pixel into a dark pixel. This is like measuring the halo around bright objects in an HDR display. He gave no indication as to how these projectors stack up in this area, but certainly suggested the new one performs very well. IMAX specs their 2D light level at 22fL (75 cd/m²), 60% higher than the DCI specification of 14 fL. They also maintain this level over the lifetime of the light source. For 3D, the GT dual-projector system uses Infitec spectral filtering technology so this is a 6p solution. The new single-projector system is a 3p system that uses circular polarization to do the 3D separation. Bonnick told us the new projector has a a special dual-lens design that he could talk much about, but Keighley said the projector featured an integrated Zscreen, the 3D add-on system from RealD. In 3D mode, the system delivers 11 fL to the eye, according to Keighley. What was not discussed was the lifetime. RGB lasers will last considerably longer than a Xenon lamp, which will save money on personnel to change lamps as well as lamp expense. So far, at least 26 exhibitors have now seen a demo in LA and the result – over 150 systems have been ordered just from two major exhibitor chains so far: AMC and Cineworld. For the demo, we saw a number of newer and older clips including the shuttle lift off, parts of Dunkirk and a scene from the Greatest Show on Earth. The 3D looked pretty good too, but I did see a little ghosting in some shots. We also got to hear their new 12-channel sound solution. I felt my seat rumble ion some of the clips from Dunkirk and they had a special audio segment where you could hear crickets, frogs and birds all around you in the theater. That was really impressive. Keighley has a special relationship with Christopher Nolan, the director of Dunkirk and many other films. Nolan is the driving force behind keeping the film format alive and has become a big supporter of IMAX – using their 70mm film camera on many projects. About 60% of the Dunkirk shots were shot on IMAX film cameras. Keighley and Nolan were the ones who got Kodak to continue making film. At the Cannes Film Festival Nolan previewed some restored footage of the film 2001: A Space Odyssey. Will an IMAX version be coming? We will have to wait and see.